About two weeks ago I got a photo frame for free at a rummage sale. Normally I wouldn’t pick up such a thing, but there was a project on my mind that I had been meaning to do for years, and getting a frame would get me halfway to completion of it. The project was to finally get around to having one of my photos professionally enlarged and printed. 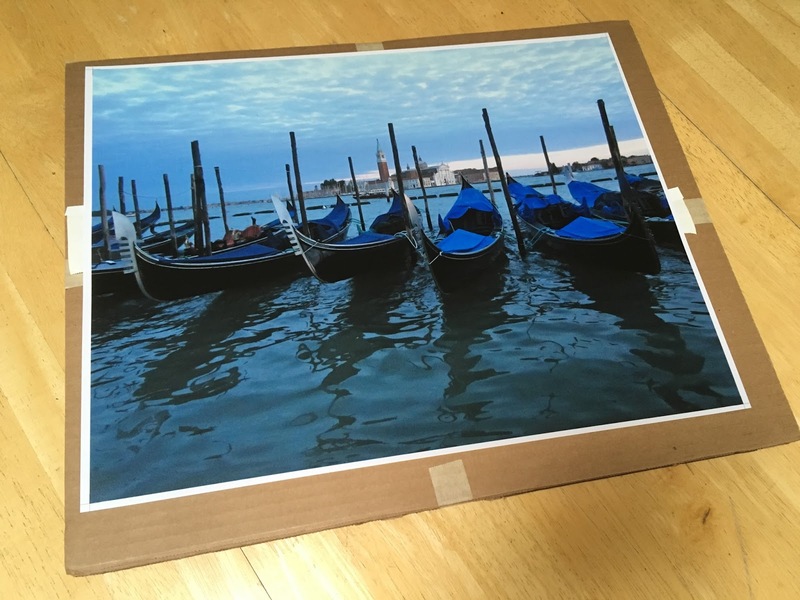 I’ve been taking photos since I was a child and I seem to have an above average skill for it, but I had never tried getting my work produced on a large piece of nice paper with a high-end printer. With the photo frame now in hand, I just needed to order the print. 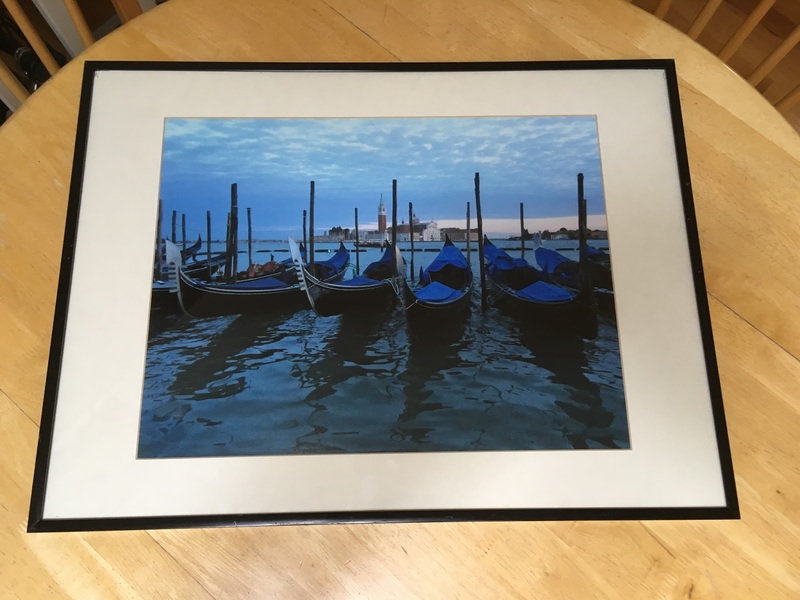 I would have ordered the print from a business nearby me, but because the photo frame was of an uncommon size, I ended up having to order the print from a company in Denver that was able to print the photo very close to the dimensions of the frame. Several days after placing the order, a very large envelope showed up at my front door, and I eagerly brought it in to see how the print had turned out. To my pleasant surprise, it looked even better than I had thought. The photo in question was one that I took last year while in Venice, Italy, and is of a group of gondolas in the foreground with San Giorgio Island in the background. It was evening when I took the photo and the overcast sky had turned a particular shade of blue that worked really well with the blue of the water and the blue coverings on the gondolas. So, yes, it’s a very blue photo. But it’s also one of my favorites from that trip. It looked good on its own, but when I placed it into the frame I realized I had something special on my hands. The frame itself isn’t that good, as you might expect from something I got for free, but its good enough to make the final product look like the sort of thing you find at a professional photographer’s showcase. Below are a pair of photos I snapped of the print and how it looked in the frame. With how well this print turned out, I’m seriously considering getting more of my photos enlarged and printed, though since I’m currently unemployed I don’t want to be spending large amounts of money on nonessential personal projects. Whenever my source of income is restored, however, I’ll definitely be looking into getting a whole collection of my photos printed.